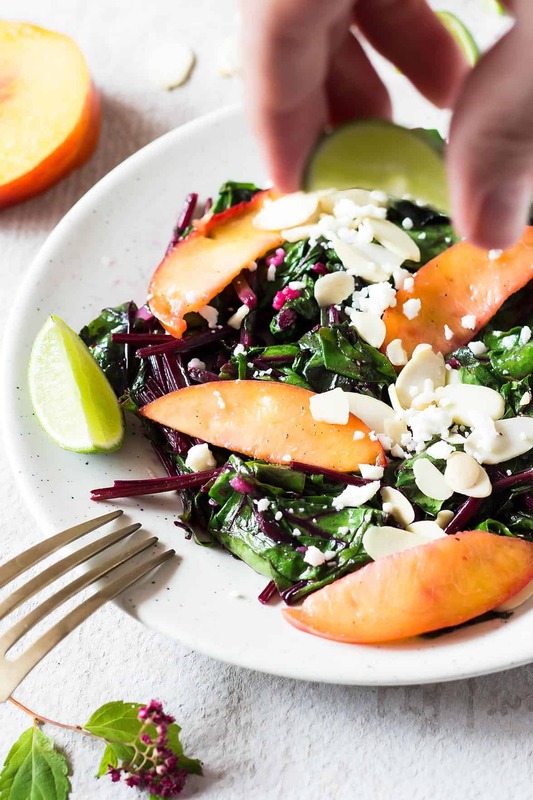 These garlicky Sautéed Beet Greens with Nectarines and Feta cheese make a delicious side dish that doesn’t let any part of the plant go to waste. This recipe is gluten free and clean eating. We spent the beginning of this summer housesitting for my parents, who were vacationing and visiting family in Europe. They have a lovely homestead in Kelowna, British Columbia where they raise their own chickens and grow a substantial about of fruit and vegetables. Taking care of everything by herself, would have been a lot for my sister who works full-time. So we were more than happy to help out and make Kelowna our first stop back in North America after a year in South East Asia. We were excited. It really is a wonderful town with great weather, lakes, orchards and wineries and we hadn’t lived in Kelowna for almost 5 years. I think we can now say with confidence, that once we do feel like settling down, it will probably be there. During our time looking after the homestead, there were daily tasks like feeding the chickens, collecting eggs and watering the garden. Other tasks were more on an ‘as required’ basis. Like picking fruit as it ripened. We had the pleasure of harvesting and enjoying many red & black currants and oh sooo many delicious plump raspberries! Another one-off task my mom assigned me with was thinning out her sprouting root vegetables. 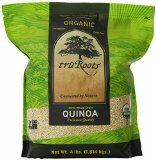 At first, I didn’t understand why she would have sown so many seeds, but I have since learned that root vegetables have tiny seeds that can sprout rather sporadically. One of the vegetables that required thinning were her beets. I probably let them grow a little too tall before I started pulling them. But we had some really rainy weather, which meant I wasn’t in the muddy garden often because no watering was required. It also meant the plants shot up in no time at all. So I ended up with a substantial amount of beet greens. I couldn’t just feed all of the foliage to the chickens or compost it. It somehow felt so wasteful. While I love beet roots – I even put them in my chocolate muffins – I don’t have much experience with how to cook beet greens. Until then, the only way I had ever used them was in Ukrainian Borscht. This delicious soup already requires beet roots. So whenever I can find them with nice beetroot leaves still attached, I have started to replace some of the cabbage in Borscht with them. But as I said, we ended up with a LOT of beet leaves and we can only eat Borscht so often. 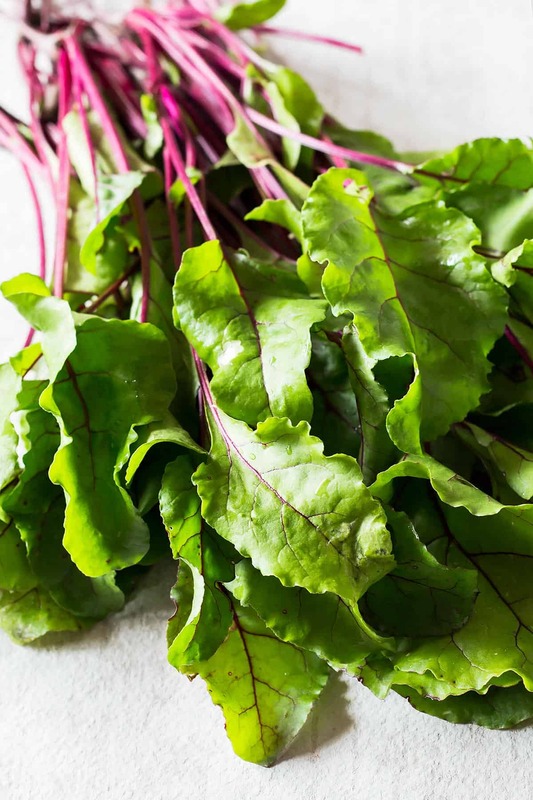 Inspired by a number of Asian dishes that are essentially garlicky sautéed greens, I wanted a similar quick to prepare and delicious beet leaves recipe. 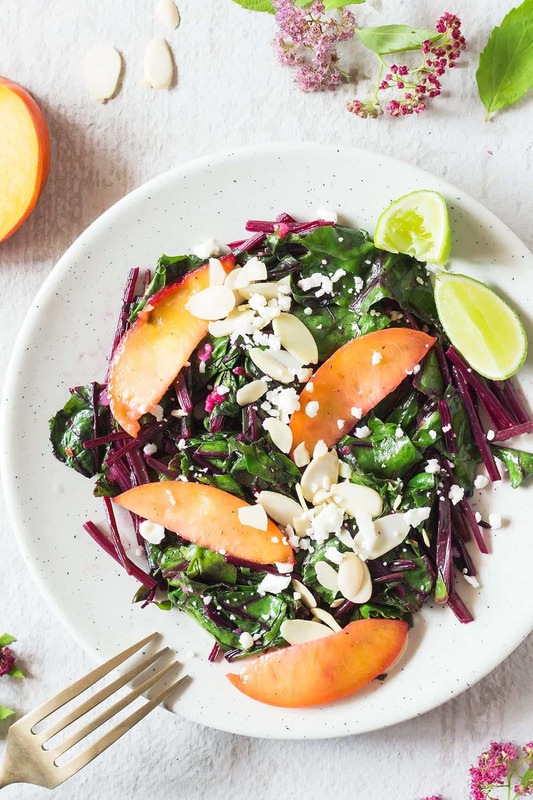 I’ve been slightly obsessed with using nectarines in savory dishes recently. Can’t wait to try this Tomato Nectarine Burrata Salad. 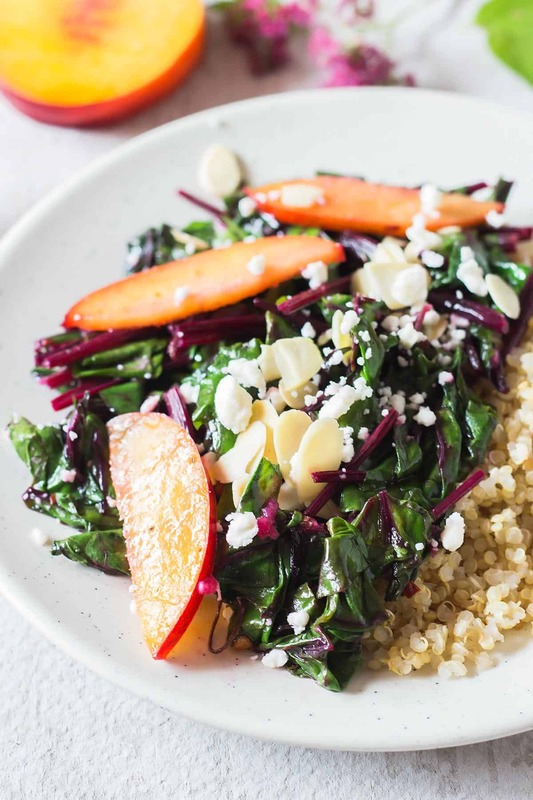 You can serve these sautéed beet greens as a side for any meal and alongside some quinoa (or brown rice) they make a pretty filling lunch as well. 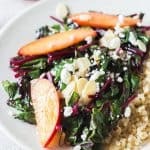 These garlicky Sautéed Beet Greens with Nectarines and Feta cheese make a delicious side dish that doesn't let any part of the plant go to waste. This recipe is gluten free and clean eating. 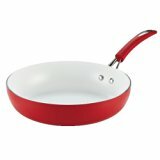 In a large pan, heat the olive oil on medium heat. Add the cut beet greens and crushed garlic and cook for 3-5 minutes until leaves are wilted. 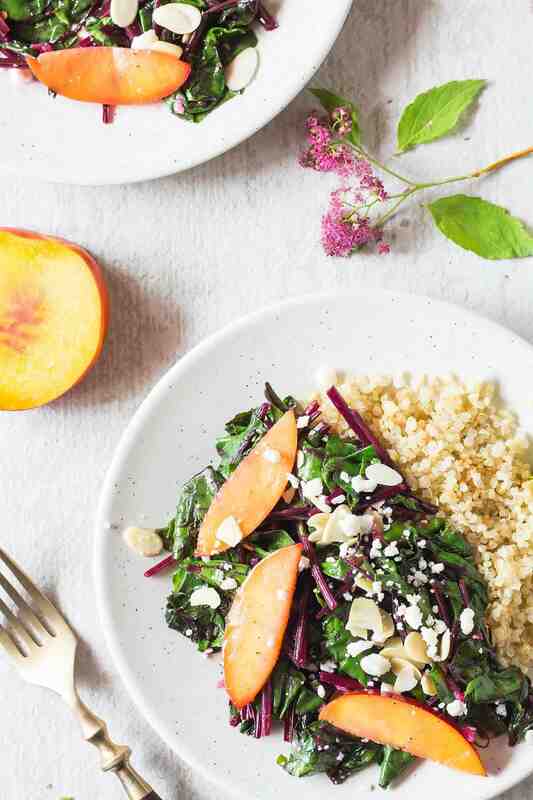 Gently toss in the nectarine slices, optional chili flakes and salt + pepper to taste. Serve with lime wedges on the side and top with almond slices and feta cheese. Drizzle with more olive oil, if desired.